Figure 1. The Memetic Association Between the Middle Permian Taxa Permotettigonia gallica and Taeniopteris sp. A. Permotettigonia gallica. B. Taeniopteris sp. based on a fossil leaf from the red beds of the Lodève Basin, France (Galter & Broutin, 2007). As you can see the edge was undulate and the leaf is much larger than P. gallica; while some may argue this makes the mimetic relationship less likely, many modern Tettigoniids mimic much larger leaves that themselves, and this size difference does not seem to present too much of a challenge. C. Margin-feeding on Taeniopteris sp. leaf. D. Hole-feeding on Taeniopteris sp. leaf. C and D based on fossils from the Waggoner Ranch Formation, USA (Beck & Labandeira, 1998). By Julian Kiely. Sorry it’s been a bit long since the last post here; the past month or so has been hectic and thus, I have not had time to finish writing the next post in the Carnivorous PlantDiversity and Evolution series. I’ve also hit a couple of problems with the next post, but while it’s not out yet, rest assure that I haven’t forgotten it, and you will get your carnivorous plant fix within the next month or so. But for the moment, I thought you might be interested to read about a topic which I find truly fascinating, and is certainly worthy of more attention: the incredible phenomena of plant mimesis in fossilised insects! It is well known that within modern animals, the use of camouflage, or crypsis, is widespread. This can take many forms and can range from the disruptive colouration of the tiger, to the superb mimicry displayed by insects. It is this latter form of crypsis which I will be focusing on in this blog post. This form of crypsis, where the animal mimics an inanimate object, is known as mimesis. 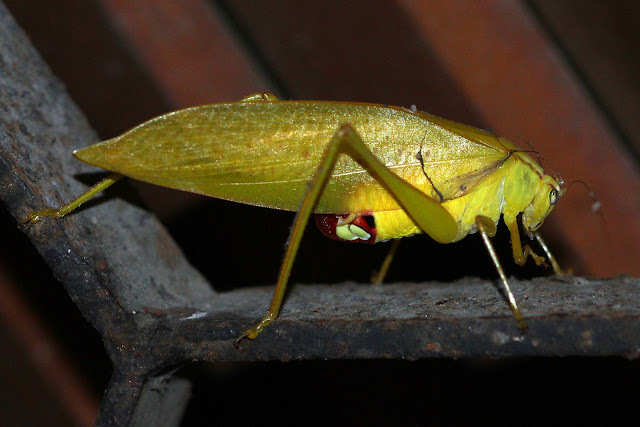 This astounding ability is well known in modern insects, with the stick insects (various genera within Phasmatodea) and the Deadleaf Butterfly (Kallima inachus) being particularly infamous examples. However, mimesis is by no means restricted to modern insects, but is also known from the fossil record. The earliest example dates back to the Permian, some 270 million years ago, indicating that the use of mimesis is an ancient survival mechanism which has been evolved and used many times in many distinct lineages of insects. The development of mimesis in insects often results in the mimicry of plant life. When this happens it exemplifies the close association between insects and plants; for a lineage to change its body over time to sometimes perfectly match the appearance of another organism is truly fascinating, as the insect then relies on its chosen template for its survival. This is a precarious specialism to have, as you depend upon the presence of your chosen plant to stay hidden, and if that plant changes or disappears you must adapt to the changes or die. Despite the risks it is a hugely successful strategy, which has even made its way into the fossil record on a number of occasions. Figure 2. A Timeline of Mimesis in Insects. 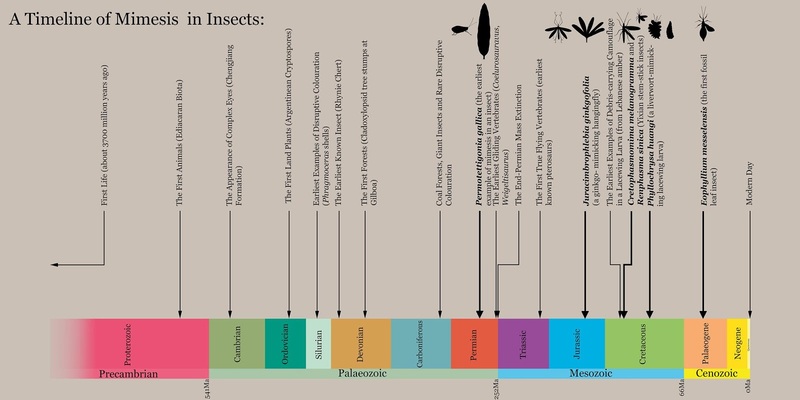 This diagram shows the key events applicable to the evolution of mimesis in insects on a geological timescale. By Julian Kiely. It is possible that mimesis first evolved within animals during the Cambrian, and possibly coincided with the origin of the first complex visual systems (Vinther, 2019). However, these early mimics wouldn’t have mimicked plants and were not insects, so for the time being we’ll put them on a shelf for another time. The first insects evolved during the Late Silurian - Early Devonian and likely originated in freshwater environments (Benton & Harper, 2009). This initial evolution was quickly followed by a transition to terrestrial habitats, where insects diversified quickly in a land dominated by early vascular plants, and towards the end of the Devonian the first forests. While it is possible that some forms of mimesis were present in Devonian and Carboniferous insects, there is no evidence for it, and even the presence of disruptive colouration is rare at this time (Garrouste et al, 2016). Currently the earliest record we have of plant mimesis in insects comes from the Middle Permian Cians Formation of France. 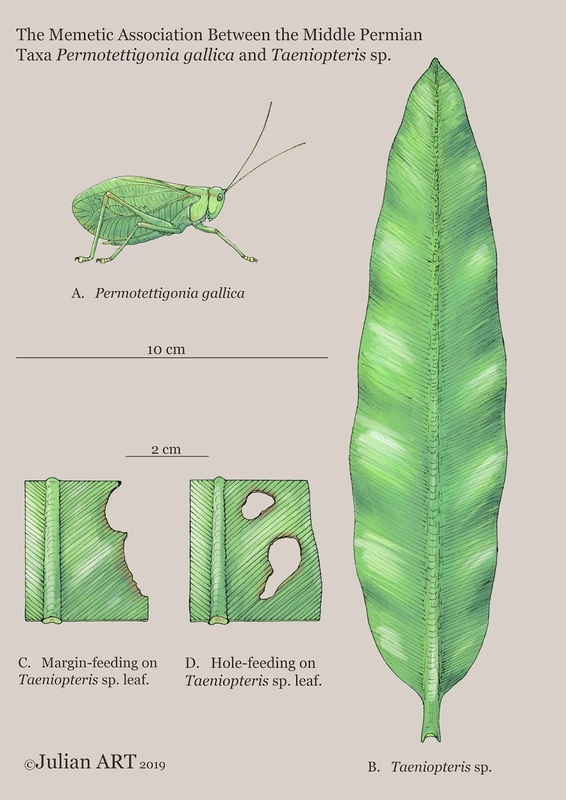 Here we find the insect Permotettigonia gallica (Garrouste et al, 2016); an extinct relative of today’s bush crickets (Tettigoniidae; see Figure 6. for a modern example). It is known from a single tegmina (the name given to the hardened forewing of a cricket) which is rather broad and leaf shaped, and has a venation pattern similar to the vein structure on the leaves of Taeniopteris (Figure 1.). 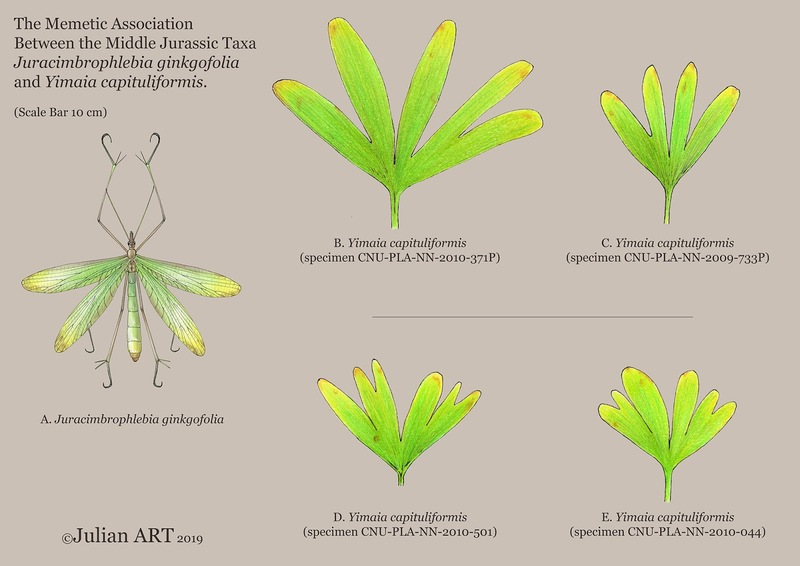 While Taeniopteris is not known from the Cians Formation (which does not preserve plant remains), it is known from other similarly aged formations, and specimens have also been found with feeding traces (Figure 1.) attributed to orthopteroid insects (Beck & Labandeira, 1998 ;Galtier & Broutin, 2008; Garrouste et al, 2016). Thus P. gallica was most likely mimicking the leaves of Taeniopteris or a similar plant. Welcome, to Jurassic Park Plants!!! The appearance of mimesis during the Permian was possibly due to the continued evolution of small insectivorous arboreal and gliding vertebrates, which began replacing the earlier aerial insect hunters (Evans, 1987; Garrouste et al, 2016). At the end of the Permian, the world was ravaged by the largest mass extinction of all time; many lineages of animal were wiped out during this extinction, leaving a void which was quickly filled by many weird new groups (interestingly, plants do not seem to have been affected as much as the animals by this extinction event, and most lineages survived into the Mesozoic; Nowak, Schneedeli-Hermann & Kustatscher, 2019). Among these were several arboreal groups and the first true flying vertebrates (Witton, 2013; Witton, 2017). It is likely that this increase in aerial predators would have driven the evolution of more widespread mimesis (and other forms of crypsis for that matter) in insects; however, this is just a speculation as we have yet to find evidence of mimesis from Triassic or Early Jurassic insects. The next occurrence of mimesis in a fossil insect comes from the upper Middle Jurassic Jiulongshan formation of Inner Mongolia. Here we find an almost perfect memetic association between a species of hangingfly, Juracimbrophlebia ginkgofolia, and the ginkgoale Yimaia capituliformis (Wang et al, 2012; see Figure 2.). Yimaia was an ancient relative of the modern maidenhair tree (Ginkgo biloba) and possessed leaves which were similar to Ginkgo. However, instead of being flabellate or bilobate as in its modern relative, the leaves of Yimaia could have up to 6 lobes, which were often long and highly divided to almost the leaf base. While the growth habit of Yimaia is not known, it can be presumed that it would have formed trees in a similar manner to Ginkgo, and would have been part of a warm-temperate or sub-tropical forest community (Wang et al, 2006). This forest system was inhabited by an incredible diversity of animals and plants, so it’s not surprising that we have evidence of mimesis here. J. ginkgofolia is a member of an extinct group of hangingflies called Cimbrophlebiidae, and like their modern relatives these flies were long boded, long legged ambush predators, which used their outstretched forelegs to hang from leaves or branches, waiting for their prey to fly or crawl by. Leaf mimicry would thus have been a useful advantage for J. ginkgofolia, allowing it to avoid detection by both predators and prey. It is thought that J. ginkgofolia displayed mimesis because its long wings and abdomen closely resemble the leaves of Y. capituliformis in size and shape when outstretched (see Figure 3.). The leaves of modern Ginkgo are often pendulous, hanging below the branch, and it is possible that Yimaia leaves also grew in this way, which would have further allowed these hangingflies to blend in with them. Similar associations are also suspected among other cimbrophlebiids, so it is possible that leaf mimesis is a common feature among this group. It is also thought that this association between J. ginkgofolia and Y. capituliformis may have also been a mutualistic one; while herbivory rates in the modern Ginkgo are rather low, many examples of insect herbivory are known from the leaves of Yimaia. A mutualistic relationship may have evolved, with the leaves of Y. capituliformis providing cover for J. ginkgofolia, while it protected the leaves by eating the insects which they attracted. Figure 3. The Memetic Association Between the Middle Jurassic Taxa Juracimbrophlebia ginkgofolia and Yimaia capituliformis. A. Juracimbrophlebia ginkgofolia. B – E. Yimaia capituliformis. The similar size and shape between the lobes of Y. capituliformis leaves and the wings and abdomen of J. ginkgofolia, as well as the similar surface textures indicates that this Jurassic hangingfly likely mimicked this ginkgoale. Scale Bar 10 cm. By Julian Kiely. Among modern insects, there is an order called Neuroptera (the lacewings, mantidflies and scorpion flies) which have developed an interesting form of camouflage in their larvae; in some species, the larvae grow long hair or net like projections, called tubular tubercles, from their backs, which they use to carry various forms of debris around as camouflage. This behaviour is often species specific, with certain species specialising in carrying different things, be it the exoskeletons of their deceased prey, or pieces of leaf litter and lichen. This debris-carrying behaviour is most common among the larvae of the Green Lacewings (family Chrysopoidae), where their carnivorous young utilise this camouflage to remain hidden from predators and their prey (which they capture with long pincer-like jaws; see Figure 4.E). While this is not strictly speaking mimesis, I thought this interesting feature would be worthy of mention, especially since it has a reasonable Mesozoic fossil record (Pérez-de la Fuente et al, 2012; Wang et al, 2016; Pérez-de la Fuente et al, 2016). The earliest examples of debris-carrying are known from inclusions within Lebanese amber, which shows that this feature was already fully developed by the Early Cretaceous. Other Cretaceous amber deposits from around the world (French, Spanish and Myanmar amber) also preserve examples of this feature, supporting an ancient origin of this specialisation among this group (Wang et al, 2016). One particularly well know species, from the El Soplao amber of Spain, is Hallucinochrysa diogenesi (Pérez-de la Fuente et al, 2012; Pérez-de la Fuente et al, 2016); it is small, with a body less than 1 cm long, and is thought to be in its third instar (i.e. it has shed its exoskeleton three times). The exceptional preservation of this specimen allowed for the detailed study of its tubular tubercles, which show an alternating branching structure with a dichotomising tip. Based on this wealth of fossil evidence, and its widespread distribution in modern species, it is thought that debris-carrying in lacewing larvae is an ancestral specialisation, which was subsequently lost in several lineages. One example of this in the fossil record is rather interesting, as it shows a transition from self-decoration crypsis to mimesis. The lacewing in question is Phyllochrysa huangi (Liu et al, 2018; Figure 4. A, D), which is known from the earliest Late Cretaceous Myanmar amber deposits. 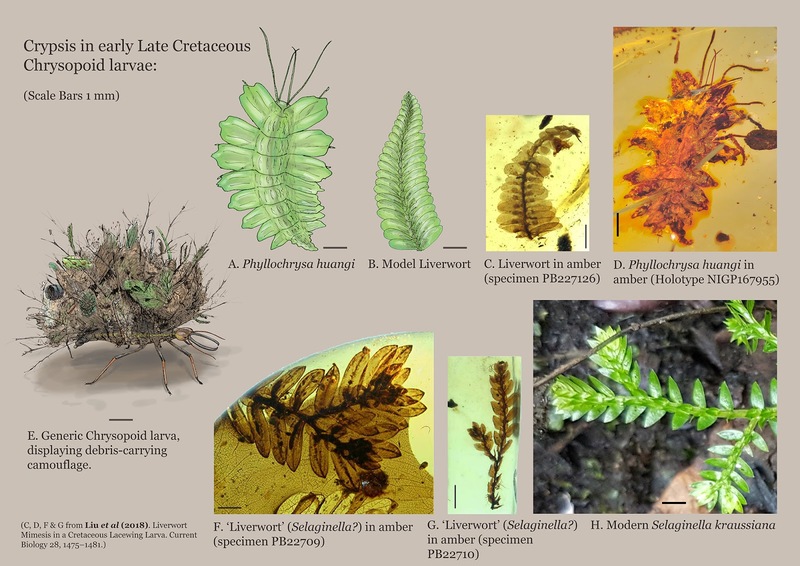 What I find most interesting about this species is that while most insects mimic vascular plants such as gymnosperms and angiosperms, P. huangi appeared to mimic a liverwort, a nonvascular plant (Figure 4. B, C)! It is small, being about 6mm long, and has large flat flanges, called foliate plates, extending from each of its body segments. These become increasingly smaller towards the posterior of the body and share some distinct similarities to several species of leafy liverwort identified from the same amber deposits (however, I have a sneaky suspicion that some of these ‘liverworts’ might be species of Selaginella – see Figure 4. F, G, H). The environment which P. huangi inhabited was a warm, humid, tropical island during the Late Cretaceous, and thus both liverworts and Selaginella would have grown amongst the damp leaf litter of the forest floor, where P. huangi hunted for its invertebrate prey. Figure 4. Crypsis in early Late Cretaceous Chrysopoid larvae. A. Phyllochrysa huangi, a mimetic green lacewing larva. B. Model Liverwort for P. huangi mimesis, based on specimen PB227126 (life reconstruction). C. Liverwort in amber (specimen PB227126). D. Phyllochrysa huangi in amber (Holotype NIGP167955). E. Generic Chrysopoid larva, displaying debris-carrying camouflage. F. ‘Liverwort’ (Selaginella?) in amber (specimen PB22709) – note the heterophyllous leaves and single central vein to each leaf, features characteristic of Selaginella (pers. comm. T. Slippey, 30/03/2019). G. ‘Liverwort’ (Selaginella?) in amber (specimen PB22710) – note the heterophyllous leaves and single central vein to each leaf, features characteristic of Selaginella(pers. comm. T. Slippey, 30/03/2019). H. Modern Selaginella kraussiana for comparison (photographed at The National Botanic Gardens of Ireland). Scale Bars 1 mm – all images to scale. A, B, E & H by Julian Kiely. C, D, F & G taken from Liu et al 2018. Stick Around for More Mimesis. Possibly the most enigmatic group of modern mimetic insects are the stick and leaf insects (Phasmatodea); this family has an almost global modern distribution and contains an incredible diversity of species, with most possessing camouflage to mimic various plant organs such as leaves, stems, twigs and bark. In many modern species, their mimesis also extends to their eggs, which can often mimic seeds (Martill, Bechly & Loveridge, 2007) While their fossil record is generally fragmentary, we have evidence for the presence of stem-phasmatods throughout most of the Mesozoic (from as far back as at least the Early Jurassic); however, the taxonomic relationship of these Mesozoic species to crown-group Phasmatodea is still uncertain, and many likely lie outside of the crown group. To cover all known species of stem and crown Phasmatodea fossils is well beyond the scope of this blog, so instead I will focus on two particularly well preserved examples, which clearly display adaptations for mimesis. The first species I will cover is Cretophasmomia melanogramma (Wang et al, 2014; Figure 5. A), which hails from the famous Yixian Formation of Liaoning, China (the same formation which has yielded a stunning array of fossils, including feathered dinosaurs and some of the earliest angiosperms). It is known from three beautifully preserved specimens (two males and one female) which are about 6 cm long and display large wings and a thin body. The female specimen is slightly larger than the males, indicating that sexual dimorphism in size was already beginning to develop within this group. The fossils also preserve some of the original patterning, showing a dark band running down the body, and darkly pigmented veins in the otherwise (presumably) translucent wings. When folded these wings would have produced a series of longitudinal stripes along the body which have been likened to the venation pattern seen within several Yixian plant species. One species which bears a particular resemblance to the colour banding of C. melanogramma is Membranifolia admirabilis (Figure 5. D), a morphospecies known only from leaf-like organs which possibly share affinities with the Ginkgophytes (although it has also been suggested to be related to the Bennettitales or Gnetales). M. admirabilis organs are dicotomising, with up to three levels of division, and in life were likely thin and translucent, with distinctive banding caused by the veins. It is this similarity which has led us to believe that C. melanogramma was using M. admirabilis as a model plant for its mimesis, possibly camouflaging itself among bunches of this organ to avoid detection from the large diversity of insectivorous birds, with which it shared its environment. Another stem-phasmatod from the Yixian is Renphasma sinica (Nel & Delfosse, 2011; Figure 5. B), which was smaller than C. melanogramma with a broader body and wings. It also preserves a pattern on the wings, which indicate a pale spotted banding pattern with a lighter interior to the wing and a darker edge. This likely constituted a form of disruptive colouration (as opposed to mimesis), where the pale spots imitate the speckling pattern of light which shines through a forest canopy, allowing it to blend into the background more. Figure 5. 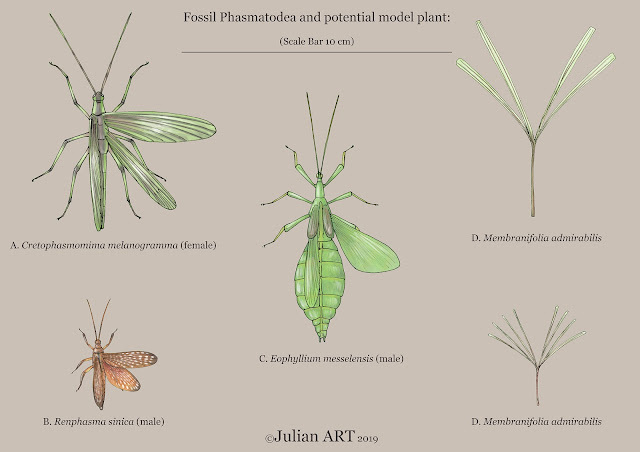 Fossil Phasmatodea and Potential Model Plant. A. Cretophasmomima melanogramma (female). B. Renphasma sinica (male) C. Eophyllium messelensis (male) D. Membranifolia admirabilis, a model plant for mimesis in C. melanogramma. Scale Bar 10 cm. By Julian Kiely. And finally, now for the last creature we will take a look at in this blog: Eophyllium messelensis (Wedmann, Bradler & Rust, 2007)! This insect is part of the modern clade Phylliinae, which are more commonly known as the leaf insects or ‘walking leaves’, and is from the Messel Formation of Germany. The single specimen is of a male and measures almost 7 cm long; similarly to modern leaf insects its abdomen is flattened and expanded into a broad leaf-like shape similar to many modern broadleaf plants (see Figure 5. C). Messel was an early Eocene tropical forest, surrounding a lake filled Maar, which contained a wide diversity of primarily angiosperm plants. By this period, the dinosaurs had already become extinct, and instead, the forest was dominated by a fauna of animals not too dissimilar from our current tropics. Many small mammals, including early horses, bats and primates, inhabited this forest, and the canopy would have been filled with a stunning variety of birds. This abundance of potential predators would have made staying hidden a difficult and unending task for E. messelensis. However, like its modern relatives, E. messelensis likely had a trick up its sleeve, to help it stay hidden. In modern leaf insects, their mimicry of plants is not simply restricted to their morphology, but also extends to their behaviour; when not remaining still, modern leaf insects often make random jerky movements with their body, and whenever they walk they move in a similar jerky fashion which mimics the movement of leaves as they are disturbed by the currents in the air. It is likely that E. messelensis implemented a similar behaviour, allowing it to complete its mimesis more completely than if it simply stayed still (Smith, Schaal & Habersetzer, 2018). Well now, it seems we have come to the end of another blog post. This was a very interesting topic to research and has greatly increased my appreciation for these fascinating fossil insects, and the plants which they mimic. It has also increased my appreciation for their many modern counterparts and has revealed to me how complex an adaptation mimesis truly is. We have seen insects which mimic leaves and other plant organs in both their behaviour and appearance, revealed the complex associations which these plants and animals maintain, and have even taken a look at the possible causes of such extreme evolution! The natural world is truly wonderful and I hope you have enjoyed learning about it. I have barely begun to scratch the surface, so I hope you stay tuned for all the blog posts yet to come! Figure 6. An example of a modern mimetic insect, a Phaneropterine Katydid (Tettigoniidae; subfamily Phaneropterinae) from Indonesia. Photographed by Franz Anthony (© Franz Anthony). If you’d like to see more photography and artwork by Franz, please visit his website, and follow him on Twitter. He posts some amazing stuff, so I would highly recommend following him! Beentji, H. (2016). The Kew Plant Glossary: an illustrated dictionary of plant terms. Second Edition. Kew Publishing, Royal Botanic Gardens, Kew. Martill, D. M., Bechly, G., Loveridge, R. F. (2005). The Crato Fossil Beds of Brazil: Window into an Ancient World. The Edinburgh Building, Cambridge CB2 8RU, UK: Cambridge University Press. Smith, K. T., Schaal, S. F. K., Habersettzer, J. (2018). Messel: An Ancient Greenhouse Ecosystem. E. Schweizerbart’sche Verlagsbuchhandlung (Nägele u. Obermiller), Stuttgart, Germany. Prof. Dr. Dr. h. c. Volker Mosbrugger, Senckenberg Gesellschaft für Naturforschung, Senckenberganlage 25, 60325 Frankfurt am Main, Germany. Vinther, J. (2019). Palaeocolour and the evolution of vision and predation in the last 500 million years. Oral lecture given at the Oxford Palaeontology Symposium, Oxford High School, Belbroughton Road, Oxford, 16th March 2019. All content ©Julian Kiely (©JulianART/ Julian PalaeoART) unless otherwise noted. Hello, I am a British BSc Palaeontology student, Palaeoartist and Natural History Artist based at the University of Portsmouth. My academic interests in Palaeontology are quite varied, however I have a particular fascination for Palaeobotany, the clade Maniraptora and integument and colour evolution within Ornithodira. My artwork focuses primarily on the credible reconstruction of extinct flora and fauna and is produced in a variety of mediums. You can follow all of my latest updates on Twitter and Facebook.